The pound fell yesterday despite the Bank of England lifting interest rates from crisis-era lows, after Governor Mark Carney said monetary policy needed to “walk not run” and expressed concern about the risks of a cliff-edge Brexit. The move raising 25 basis points to 0.75pc was widely expected, although the unanimous decision of the BoE’s nine rate-setters was not. But sterling later succumbed to selling pressure and dropped as much as 0.8pc to $1.3016, down from around $1.31 before Mr Carney had started his news conference. A stronger dollar added to the pound’s struggles. The currency also fell against the euro, by 0.4pc to as low as 89.25 pence. “For me the pound is moving lower as Carney is showing some sympathy towards a possible hard Brexit, they are preparing for it, as we know. “The ‘walk not run’ comment looked to coincide with a further solid move lower for the pound,” said Neil Jones, head of Hedge Fund FX sales at Mizuho. 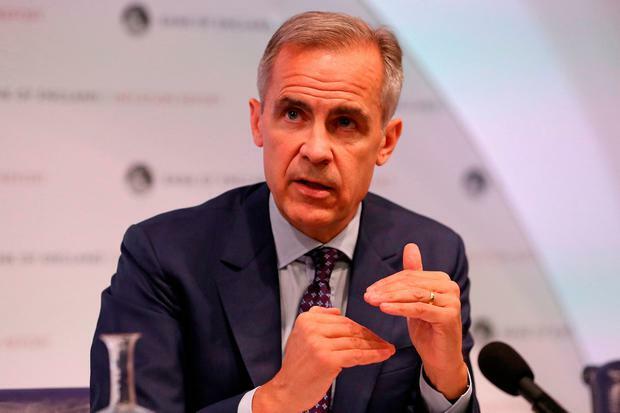 Given the lack of certainty about the sort of trading deal Britain can secure with the European Union, and with inflation forecast to fall towards its 2pc target over the next three years, Carney reiterated that the bank would raise rates only gradually and to a limited extent. “Policy needs to walk – not run – to stand still,” he said. Investors have been betting on there being no further hikes before Britain leaves the European Union in March, limiting any strength in the pound. Sterling has lost almost 10pc of its value since hitting a post Brexit-referendum high in April, amid worries that Britain will fail to secure a trade deal before it exits the EU in March. London and Brussels, as well as members of UK Prime Minister Theresa May’s government, remain far apart on what the future trading relationship should look like. The market is pricing in the next rate hike for September 2019, based on the money market ‘Sonia’ curve, Societe Generale fixed income strategist Jason Simpson said. In making its predictions, he said the market was “whacking in some big assumptions like a smooth Brexit”.